Ming-gah-lah-bahr! Although Myanmar is a ‘new’ origin, Robusta was first planted in Thanin Thar Yi in Southern Myanmar in 1885 by a British missionary with seeds from India. Arabica, namely S795, and then SL 34 soon followed and spread northwards. It was not until the arrival of a few Scotsmen in 1930 that the first arabica seeds were introduced to Pyin Oo Lwin in Mandalay division. Coffee was produced privately up until 1962 when the government nationalised all the farms. Production plummeted and any coffee that was grown was destined for the local market. The government started promoting coffee 35 years later in 1997 as both a viable revenue stream and a way of fighting against deforestation. They made 10,000 acres of land available at a low price to buyers who would use the land to farm coffee. It was then that the first single estates emerged, helped and trained by government agronomists. It was a period of experimentation and learning but also one of expansion to Shan and other areas of the country. In 2006 the government turned its focus to Shan state where they saw coffee as an alternative to poppy seeds. They facilitated micro loans to poppy producers to switch over to coffee. During this time any coffee exported was to bordering countries and other Asian countries. This remained the case until the UN sanctions were lifted in 2011. With the lifting came the arrival of USA aid and their implementation arm, Winrock. Their aim was to provide technical training to farmers, with the focus on small holder farmers in Shan. Working with 22 communities there, their work centred on specialty coffee, especially dry natural and honey processed coffee. Shortly afterwards, the Coffee Quality Institute (CQI) complemented the work done by Winrock focussing on specialty grading and cupping and organising an annual national cupping competition. This elevated the international awareness of specialty coffee in Myanmar and helped create demand for this new export product. Existing players grew from strength to strength and new companies, processors, and farmers joined this thriving industry. To support this industry, the Myanmar Coffee Association (MCA) was created in 2014. The association’s purpose is to support the coffee industry – from producers right up to cafés. There are currently six ‘clusters’ that represent different parts of the country: Pyin Oo Lwin, Naung Cho, Mogok, Ywar Ngan, Than taung & Chin (the newest addition). We first explored this origin in 2016 to analyse its potential and imported Myanmar coffee in Spring 2017. We brought a selection of single estates, small holder coffees, single varieties and different processes from different producing regions to the UK and Europe. The jewel in the crown of this selection was a couple of bags from Chin Litai, a group of farmers we supported through a series of educational workshops with partners at origin. We helped fund and attended the second workshop in February 2017. 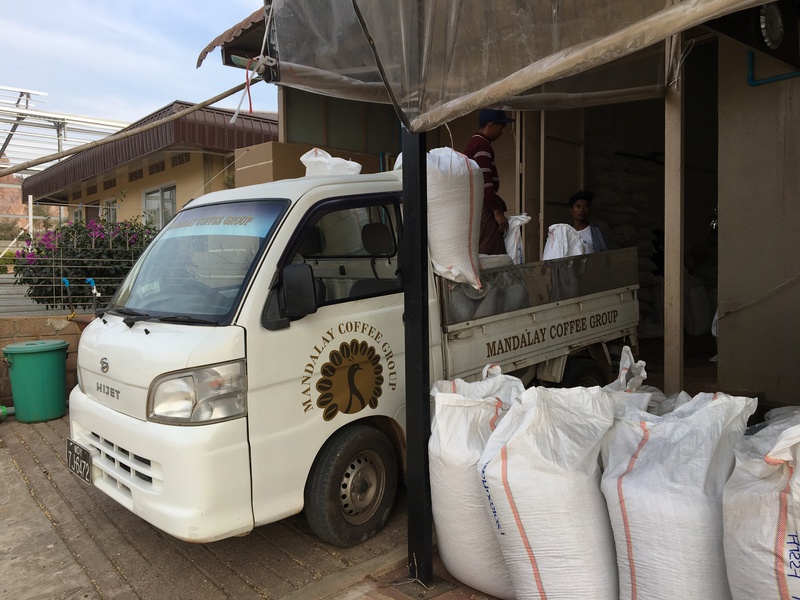 The goal of this trip in 2018 was to visit all our partners in the various regions we source coffee from in Myanmar. Most of the trip was spent in Pwin Oo Lwin and Ywar Ngan, with a short stop at Naung Cho. Because of access restrictions imposed by the government, we were not able to visit Arrow Brothers in Mogok, but we were able to see the owner, Thi Ha, in Ywar Ngan. After landing in Yangon and a short immersion in Burmese culture, we headed up to Mandalay for our first stop. Mandalay Coffee Group (MCG) is an exporter and processor based in Pyin Oo Lwin, Mandalay division. It’s a private exporter founded in 2014 and has 50 shareholders, many of whom are some of the most influential people in this nascent industry. Although many shareholders are owners of larger estates in Pyin Oo Lwin, some come from other states and divisions such as Mogok and Shan. MCG process and export coffee from these large estates in Mandalay division but also buy red cherries from small holders in Mandalay and Shan that will be exported under their specialty selection. We were impressed with their quality controls and attention to detail on every level, from receiving the cherries to preparing the coffee for export. Evidence of this hard work was proven during various cupping sessions held at their quality lab and ran by Amy, General Manager of MCG. It was then time to visit the estates in Pwin Oo Lwin that we work with, and meet with new contacts. Our guide and translator U Sai Wan from MCG took us to his farm Greenland, he imparted a wealth of knowledge about the many nuances and particularities of the coffee industry in Myanmar. He was one of the first people to get land from the government to grow coffee, starting with just 30 acres in 1999. He expanded incrementally year on year to reach the 350 acres of land dedicated to growing coffee which he named ‘Greenland’. The main varietals he grows are S795, SL 34 and Catimor, which are also grown across the region. His passion for coffee shines through everything he does, be it the new varietals in the nursery, the way he processes his coffee and runs his farm, to the quality of espresso he served us at the end of our visit. This passion is not exclusive to his farm; he is also the head of sales and marketing at MCG, one of the country’s Q graders, and a key player in MCA which promotes all the producing regions in Myanmar. 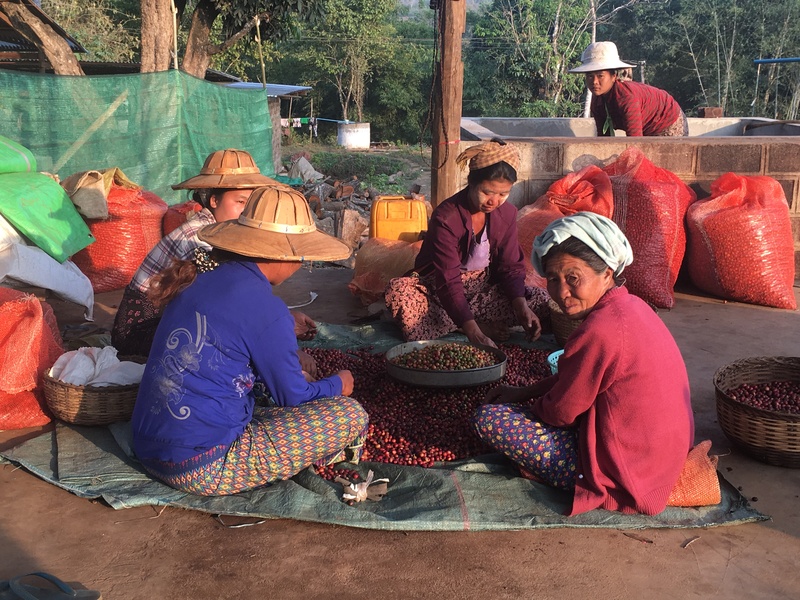 One of the big challenges faced by coffee farmers in Myanmar is achieving a financially sustainable way of growing coffee. Most farmers have survived in the coffee industry due to their other businesses propping up their farm (construction, mining etc). 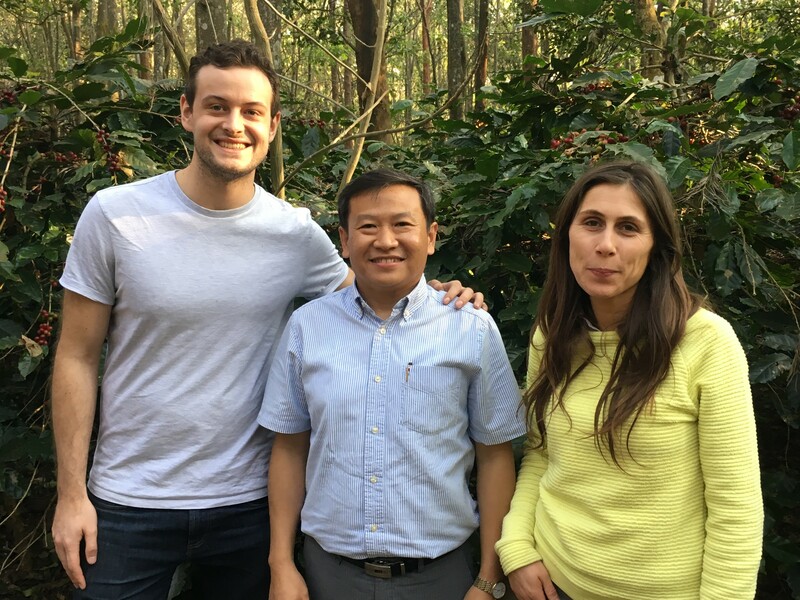 U Sai Wan has been instrumental in adding value to Burmese coffee and connecting international buyers to the estates. We also had the pleasure of visiting the oldest estate in the region, Ngu Shwe Lee, which was founded in 1997. U Kyaw Sein, the founder, was involved in growing peas and mining Jade before he turned his hand to coffee. The main shade trees are silver oak and macadamia, with Erythrina the preferred short-term shade solution. Once the silver oak and macadamia grow to a certain height, often the Erythrina is removed. Macadamia is a common source of additional income for many coffee farmers across the country and we sampled the goods over a coffee with Kyaw. It garners a better price than coffee, but it takes double the amount of time before the first harvest. Blue mountain farm, owned by U Kyaw Htwe Naing, was started in 2003. The farm is so called because he has a few blue mountain coffee plants on his farm. He produces in an organic fashion and uses the equivalent of a 40 twenty foot containers of dung per year to fertilise the farm. This is also the main source of fertilizer across the region. We were impressed by his Art Deco house which he designed himself, it turns out coffee is not his only passion. He also designed the stylish bathroom at MCG which you’ll appreciate it if you ever get the chance to visit! Our last stop in the area was Sithar, named after the reservoir next to the estate. U Min Hlaing uses the farm as an experimental plot for specialty coffee and his own use, as he is one of the biggest roasters in the country. The key takeaway of his farm was the diversity of flora and fauna and the vertical integration from growing the coffee to serving it to the end consumer. He has a coffee shop called Panntawin, attached to a garden centre where he and his wife sell a variety of exotic plants. He will only sell the coffee from his farm if the buyer is willing to pay a better price for his coffee than he is. With some stunning naturals coming though on the cupping table, we’ll see how that pans out. For the estates visited, altitude ranged from 1050 to 1150masl. During one of the cupping sessions at MCG, one of the coffees drew our attention due to its sweetness. We took the opportunity to visit the farm, just over the border in Shan State called Moe Htet Estate, located in the Naung Cho cluster. We met the agronomist, U Kyaw Wan He, who looked after the farm as if it were his own. He shares his knowledge by organising monthly workshops, contributing to the local coffee community. This year the harvest started earlier but it’s going to last longer as the temperature has been a great deal colder than normal. There have been times where the thermometer nearly hit 0 degrees Celsius, slowing down the cherry development. The core of the harvest will be end of February/early March. Overall, we were impressed by the management and technical expertise of Kyaw and his team. He received several different varietals from the Food and Agriculture Organisation (FAO) four years ago and started an experimental plot with 11 varietals including Colombia, P88 and Brazil H144. It was then time to leave our friends from MCG and visit the biggest MCA cluster: Ywar Ngan. In contrast to the large single estate model of Mandalay, Ywar Ngan is characterised by small holder farmers organised into communities, the majority of which belong to the Danu and Pa-o tribes. We imported this coffee last year and sourced it via the processor Shwe Ywar Ngan. 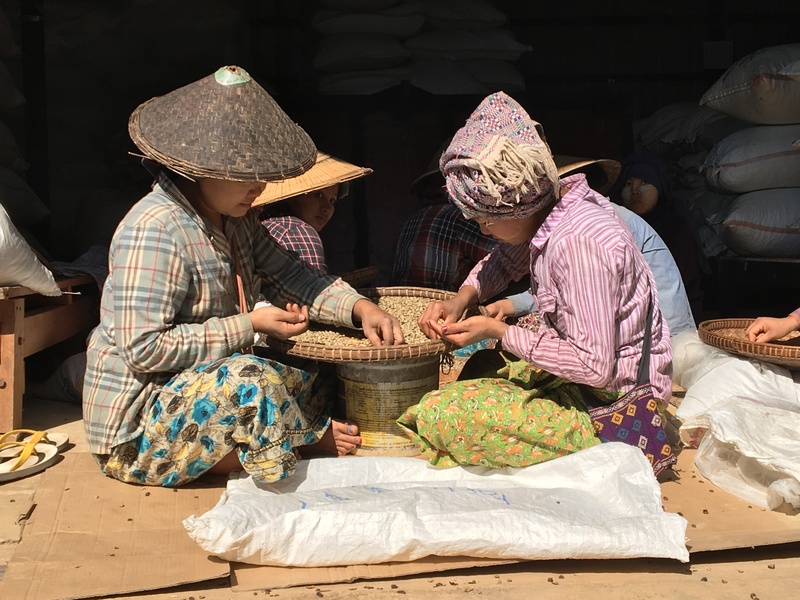 This part of our trip was split between meeting different communities, cupping their coffees, and visiting the Shwe Ywar Ngan processing facility. Shwe Ywar Ngan was created by U Win Aung Kyaw, who has been roasting coffee since 1975. The ‘Godfather’ of the industry, he has been influential in setting up Shan as a coffee producing area. In 1998 he bought land for a farm and started to process his own coffee. He got the idea to grow coffee when he was hunting wild boar in the area and thought it had great conditions for growing coffee. With the help of three coffee experts from FAO and some government micro finance loans to small holder producers in 2001, the seeds were sown that would one day make this the biggest coffee producing area in the country. In 2003, Shwe Ywar Ngan distributed 200,000 seedlings to farmers, the vast majority of these were red catuai, which was identified as the most suitable varietal for the region by the FAO. The impetus was to convert poppy farmers to coffee farmers and through his long-term support and guidance, he gained the trust of the local communities. He started to buy green beans and cherries for his roasting business in small quantities and today processes up to 300 metric tonnes of cherry for export. Incremental growth has been the key and he is a very well respected and revered member of the Myanmar coffee community. He is Vice President of the MCA. His daughter Su Nandar Linn is now running the processing facility. She is highly valued in the business and community in her capacity as a Q grader and sourcing and processing the best coffee available. They buy red cherry and like the rest of the country, do a dry fermentation for their washed coffees. They use buckets instead of tanks as they find it’s faster and provides for a more even way of fermenting. 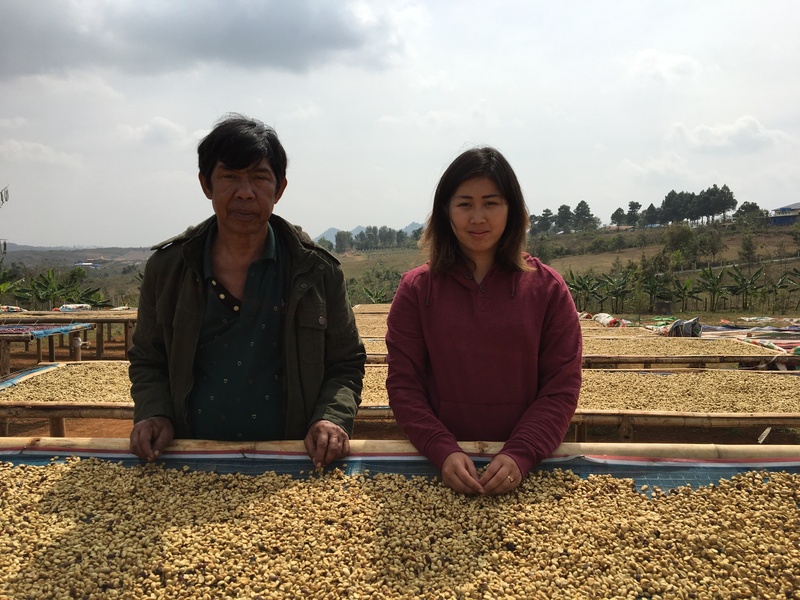 There is not much water in Myanmar and three years ago Shwe Ywar Ngan started focussing on honey processed coffee, both adding value to the coffee and reducing water usage. Following this train of thought they also decided to work with specialty dry natural processed coffee. We cupped the freshly harvested coffee on site with help from our dear friend Thi Ha, a young and ambitious coffee entrepreneur and farmer from Mogok, who was able to join us for all the cuppings and visits at Shwe Ywar Ngan. Thi Ha is a certified Q grader, and owner of the organic farm ‘Arrow Brothers’, which won the best washed coffee in the annual cupping competition in 2017. He kindly roasted all the samples we cupped on an Ikawa – it was great to see a product made in London in use in Myanmar! Unfortunately we could not visit his farm because of government restrictions in that area. Thi Ha has designed a purpose-built fermentation tank for experiments regarding carbonic maceration. We look forward to cupping these coffees and using the new flavour adjectives we picked up during our culinary experience in Myanmar. Talking of cupping, the washed and natural from Hte Kone village really jumped out at us on the table. Shwe Ywar Ngan buy coffee from 40 of the 93 coffee producing villages in the Ywan Ngan township. We visited three of these villages and were blown away by the quality of red cherries on the African beds present at each village. The average farmer has a 1-2 hectare plot with altitude ranging from 1400 to 1600 masl and 37 of the 40 villages are part of the Danu hill tribe. The last village of the day we visited was Hte Kone, where we had a meeting with U Maung Nu, the elected official that represents the Danu. He oversees the quality at the various villages and helps coordinate the training carried out by Winrock. As the ladies were putting the tarpaulin to cover the red cherries and nightfall was setting in, we shared a Quaich of scotch whisky provided by our friend Eion, providing a magical moment where all members of the coffee chain were celebrating this new friendship. We then headed to Yangon. We passed by Easy cafe, one of the city’s most famous specialty coffee shops, and had a lovely nitro cold brew with Javier Phua, head Roaster and founder. He is a force for change in this rapidly developing specialty coffee market. We then headed to the airport and left the country how we arrived, in awe of the spiritual golden pagoda, an icon of the country. Great work has been carried out in Myanmar to promote and produce top-end specialty coffee, with the focus on competition winning lots. 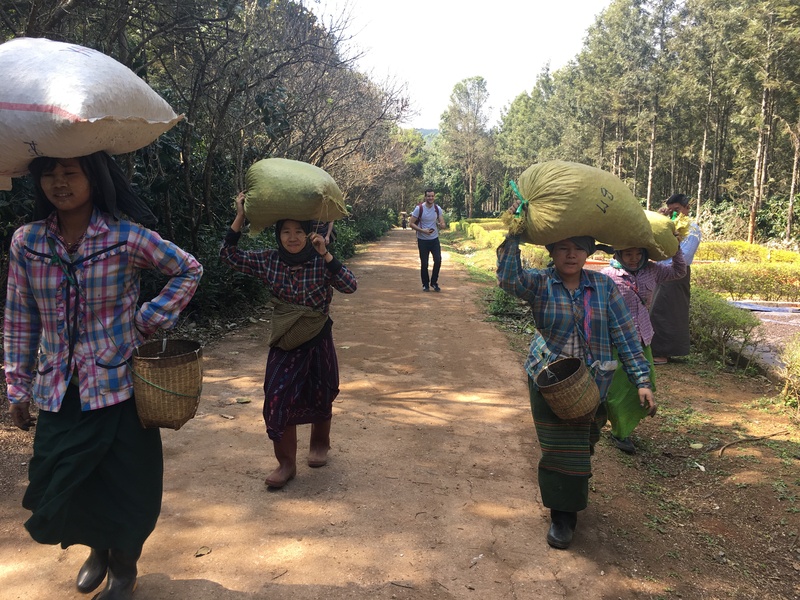 Most coffee exported from Myanmar is high-end specialty coffee, however now might be the time to consider solid quality in the lower-end specialty market ranging from 80 to 84 SCAA point coffees. At the moment Myanmar has no coffee classification system, which means they only send out their best coffee for export. This presents an opportunity for Myanmar to create their own national grading classification system to enable them to produce different qualities to reach wider markets. We achieved our goal of learning more about our partners in this complex and nascent coffee producing origin. We noticed a great collaborative rapport among the coffee community, despite there being a fragility in the supply chain in some places. This fragility is caused by a fragmented path to export. We believe in this origin and we will support our partners to help strengthen the value chain within the Myanmar coffee industry. We are looking forward to continuing to source coffee from existing relationships and creating new ones. In its transition to democracy, Myanmar is undergoing a humanitarian crisis with the Rohingya in Rahkine state. It’s a complex conflict with many uncertainties surrounding what has happened. We believe in the farmers we visited and we hope that our trade, even though on a small scale, will help bring economic and social stability to a country that needs it. Chay-tzoo-beh to all the people that made us feel so welcome and to the roasters that supported this new origin last year. We are more than happy to talk further about this origin if anyone would like to learn more.